Schwitzer Student Center, Registration begins at 7:30 a.m., Race starts at 9 a.m. 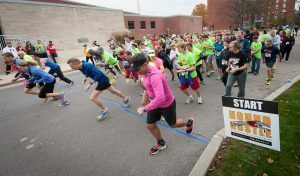 The fourth annual Hound Hustle 5K is an event for everyone with proceeds supporting student scholarships and programs. The course takes participants on a tour of the beautiful University of Indianapolis campus and the University Heights neighborhood. Registration required; $20 advanced registration or $25 day-of-registration. Includes T-shirt.